The Internet in Cuba: What happened to the ALBA-1 undersea cable? What happened to the ALBA-1 undersea cable? 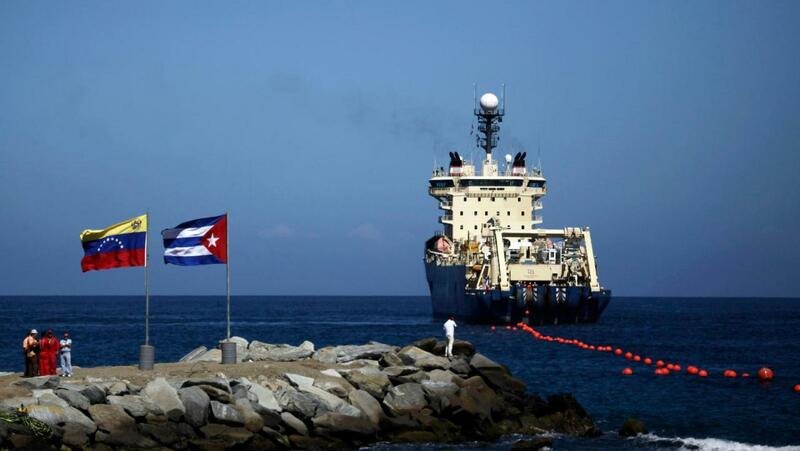 Associated Press reporter Andrea Rodgriguez, @ARodriguezAP, has published an article stating that "mystery shrouds the fate" of the ALBA-1 undersea cable linking Venezuela and Cuba. Cuban officials promised that the cable would in use last fall, but Rodriguez finds no evidence that it is use in government offices or elsewhere. She interviewed a dozen employees of public institutions who said they have seen no noticeable improvement in their work connections. Some said that download speeds have even gotten a little slower. She also made "multiple attempts to get Cuban and Venezuelan government officials to comment," but was unsuccessful. She is a reporter who is on the ground in Cuba and unable to find evidence of the deployment or application of the cable. There have been claims of corruption, and some of the peple Rodgriguez interviewed corroborate that assertion. I have suggested earlier that a fast undersea cable would be a strong link in a weak (or nonexistent) chain if Cuba's domestic Internet infrastructure were not upgraded to utilize it. Skilled networking technicians would also be needed. Perhaps capital to upgrade the domestic network is not available. The Arab Spring may have frightened the government. Raúl Castro opposed the Internet when Cuba connected in the mid-1990s. In October 1997 he stated that "Glasnost, which undermined the USSR and other socialist countries, consisted of handing over the mass media, one by one, to the enemies of socialism." Perhaps he fears an Internet supported "Cuban Spring." Or, maybe the answer is none of the above -- or all of the above. Whatever the reason, it seems that a reported 70 million dollar investment is gathering barnacles and little more. Is Ms. Rodgriguez wrong? Does anyone have evidence of the cable being in operation? I would love to hear about it and, even better, run a few pings and traceroutes. Hi Larry, there is a rumor in Havana that dial-up internet access will be sold to Cuban nationals shortly at +-6 USD per hour of connection, and email-only accounts at +-1.50 USD. This may not look like a great thing in other countries, but if it is true, for Cuba it will be a great step on the right direction. Buenas dias! That is good news, but it is also sad that there is nothing more than dial up. Have you heard anything about the cable and its application? El cable entrará en operaciones a inicios del segundo semestre de 2011. Unfortunately, I got nothing new about the cable, just a deep and mysterious silence. About the new service for Cubans, a friend of mine had access to a "resolution" (kind of a law) from the "ministry of finances and prices" signed on May 5, where the new services and prices are mentioned. If we are lucky, we might be able to see this resolution (in Spanish) on the next issue of "Gaceta Oficial" (www.gacetaoficial.cu) where "most" of Cuban laws and resolutions are published. I am not surprised that the will only allow dial-up connections, even with the cable I think they don't really have infra-structure for nothing better than this, and allowing dial-up connections may provide them with the necesary funds for further improvements. That is an interesting point -- I suggested that political fear and lack of complementary infrastructure were two possible explanations for the missing cable. Allowing dial up may seem somewhat safe today since so much of the Web -- video, Facebook, etc. is not accessible at those low speeds. I guess they could see this as a somewhat "safe" way to raise some money. Please let us know what is published and when (if) the new rates are established. The resolution sounds like it applies to hotels but does not say anything about homes. A propuesta del Ministerio de la Informatica y las Comunicaciones, se ha decidido, establecer las tarifas a la poblacion, en pesos cubanos convertibles (CUC), para los servicios de Acceso a Internet y Correp Electronico Internacional, asi como la aplicacion de las tarifas para los referidos servicios en las instalaciones hoteleras. It does not say explicitly that home connections will be allowed, but the reference to hotels is just a clarification, something additional, not the main topic. This is why I said it is just a rumor. I assume that more resolutions will be published if it happens to be true. Let us know when things change.